Lilianne Bidou, Lauren Purnell, Sam Williford and Kate Albers are second-year International Development students at SAIS who recently traveled to Kampala, Uganda to explore avenues for the International Center for Research on Women to collaborate with local organizations to better design women's empowerment programs in the country. The IDEV Practicum allows students to work directly with public, private and non-governmental organizations as a capstone to their graduate studies. The IDEV Practicum Blog is a six-part series that chronicles the travels of SAIS IDEV students who take on client projects over winter break. After navigating the dusty streets in vain, we finally came upon the modest offices of Barefoot Law in Kampala, Uganda. Awaiting us with a smile was Gerald Abila, the 35-year old local legal legend who founded Barefoot Law with his IPhone 3GS in 2012. Abila introduced us to four Ugandan lawyers, the entirety of the Barefoot Law Women’s Property Rights Initiative (WPRI) team. In one of our most inspiring meetings, they gave us insight on the formidable legal hurdles Ugandan women face, and the innovative legal projects WPRI uses to help them overcome. Ninety percent of rural women in Uganda work in agriculture, producing an estimated eighty percent of food crops, and contribute ninety percent of the labor force in food production. Despite this significant contribution, women own only about seven percent of land in Uganda, and, of those, ninety-three percent claim access to land only through a male relation (Political Economy of Gender in Sub-Saharan Africa 2017). The Barefoot Law legal team helped us to understand that this inequality is not wholly based on national Ugandan law. In fact, since the 1990s, Uganda has adopted legal provisions to protect women’s access to land. The Constitution provides for equality between men and women, including the acquisition and holding of land. Articles 21, 32, and 33 of the Constitution defend affirmative action and seek to remedy the social imbalances women face in ownership of productive resources. Nevertheless, the 1998 Land Act relies heavily on customary law, one of many cultural and social barriers that women face to land ownership. Women’s access to land is one of many areas the International Center for Research on Women (ICRW) seeks to explore as it opens its new Africa Regional Office in Kampala. 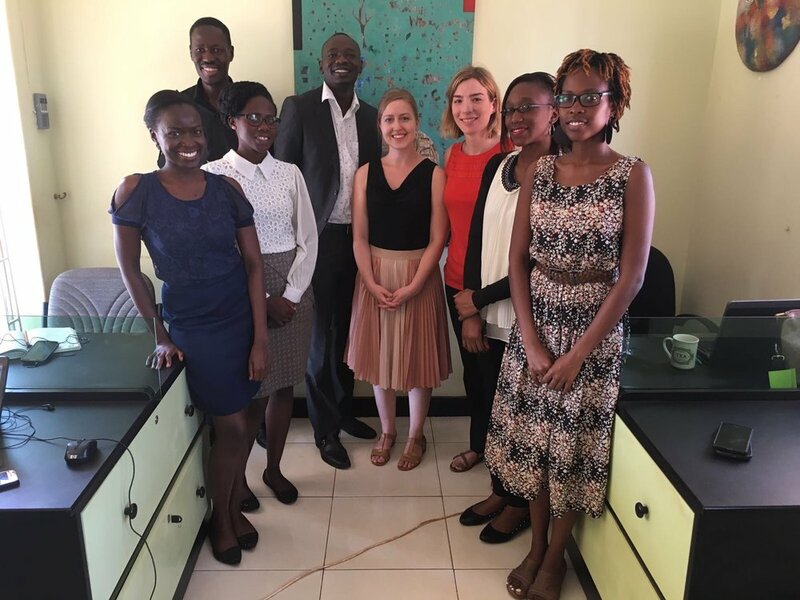 Our IDEV Practicum team interviewed a series of potential partners – from local nonprofits like Barefoot Law to Embassies to private development organizations – to get a better sense of future directions for women’s empowerment programming in Uganda. The disparity between the formal legal framework and the reality of women’s access to productive resources on the ground emerged as a theme throughout our discussions. While land rights may seem to be a niche issue, it speaks to multiple facets of women’s empowerment work in the region. One of the biggest hurdles Barefoot Law addresses is the lack of access to information for rural women. As a small and nimble team of Ugandans, they conduct local sensitization campaigns to inform women of their rights. For example, few women in rural areas know that the Amendment to the Land Act of 2004 stipulates that before a man can dispose of family land he has to seek consent from his wife. Despite Uganda’s gains in access to education, too many women in these contexts are illiterate and are thus unable to educate themselves on these issues. Perhaps most challenging is the fact that many women conceptualize themselves as the property of men, forced to accept these inequalities as natural and correct. As a fledgling branch, the ICRW Africa Regional office has much to gain by partnering with larger organizations – the Oxfams, Mercy Corps, and DGFs that define much of the development landscape. But there are also unique opportunities and innovative projects to be found in local organizations run by Ugandans and for Ugandans as well. This dynamic team and their ability to reach communities at the grassroots level is not only sustainable, it provides a bulwark against shrinking civic space in the country. The success of this model showed us that local partnerships might have the ability to affect even more meaningful change in the lives of ordinary Ugandan women. Such local partnerships could become a strategic asset to ICRW as they expand their activities in the region. Political Economy of Gender in Sub-Saharan Africa. April, 2017. Johns Hopkins School of Advanced International Studies Africa Studies Conference. Washington, D.C.
PHOTO CREDIT (COVER): Untitled by Gerritbil / 6 images, licensed under Creative Commons Zero (CCO) License, via Pixabay.